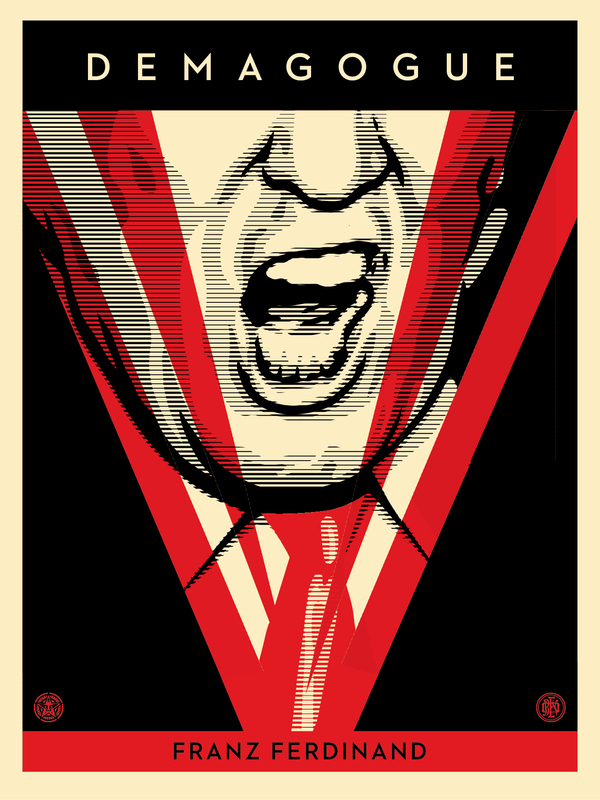 Artist Shepard Fairey has joined the “30 Days, 30 Songs,” project, adding his talent to the latest song, “Demagogue” by Franz Ferdinand, with a print of Trump’s screaming mouth. Accompanied by a music video that looks like an animated version of Fairey’s print, Franz Ferdinand’s song is about as blatant with its Trump references as it can get. It must have been written and recorded recently, as it references Trump’s bragging about sexual assault, as well as going in on his fear-mongering and the size of his hands. A demagogue is motivated by ego and self-interest. A demagogue amplifies prejudices and fears, whipping up a fury of hatred to distract from their lack of reasoned argument or considered thought. A demagogue makes hollow promises. To return a nation to a fantasy state of greatness that never existed. To solve everyone’s problems. A demagogue offers no evidence to support the promises they make. A demagogue is not interested in the future and prosperity of the nation they wish to command, only in their own power. A demagogue questions and undermines the validity of the democratic process, claiming it to be rigged against them. A demagogue is a bully. A demagogue is a narcissist, prone to comically exaggerated acts of vanity. A demagogue is often a sexual predator, abusing their power to satisfy their lust. A demagogue has no interest in facts or truth, lying easily and freely to meet their desires. A demagogue preys upon divisiveness: they declare some ethnic or social group to be the enemy, and insist we rise together against them. A demagogue has no regard for the vulnerable in society. They are to be derided, rather than cared for. A demagogue is hot tempered and irrational, prone to capricious violent outbursts triggered by the slightest puncture of their gossamer-thin skin. A demagogue uses any means to suppress their opponents, threatening to lock them up, and then, once in power, making them physically disappear. A demagogue suppresses any voice that dare speak out against them. The free press is an early target: a demagogue undermines the credibility of the press during their rise to power, and then censors the press once they have seized power. A demagogue is consumed by ambition, insatiable like the thirst of a rabid dog. A demagogue is ultimately insecure, with serious psychological issues. Emotionally unwell. Unstable. A demagogue is a threat to their own nation. The more powerful the nation, the greater the threat to the entire planet. The music video for “Demagogue” is embedded above, and its full page on “30 Days, 30 Songs” is here. Fairey’s print will be available to buy starting on Oct. 18 here. You can see the full image below.